The stress of returning to work on a Monday morning can trigger a dangerous increase in blood pressure, according to a study. The Tokyo Women's Medical University study shows blood pressure readings are higher than at any other time of the week. It may explain why deaths from heart attacks and strokes tend to peak on a Monday morning. There are 20% more heart attacks on Mondays than on any other day. Heart disease is Britain's biggest killer. Around 270,000 people suffer a heart attack every year and nearly one in three die before they even reach hospital. High blood pressure, or hypertension, affects one in five people in the UK and is a major risk factor for heart disease. The higher it climbs, the greater the force exerted by blood on the walls of the arteries when the heart beats. In some patients, it's possible to get blood pressure readings down by switching to a healthier lifestyle. But hundreds of thousands more need a daily quota of pills to control it. Measuring blood pressure can be difficult because it can vary from one day to the next. To see how it changed over the course of a week, researchers from Tokyo Women's Medical University in Japan, fitted 175 men and women with a device that would measure their blood pressure round-the-clock. A week later the recruits returned the devices so that researchers could assess how blood pressure had changed. The results, published in the American Journal of Hypertension, showed a surge in readings in those getting ready to go back to work on a Monday morning. Volunteers who stayed asleep did not experience an increase, which suggests work-related stress is most likely to blame. Professor Keith Fox, from the cardiovascular research unit at Edinburgh Royal Infirmary, told BBC Online an early morning rise in blood pressure is probably a normal part of the body's 24-hour rhythm and unlikely to be a problem for healthy people. But he said: "If somebody already has cardiovascular disease then it might just tip them over the edge and trigger a heart attack. He added that the return to early waking hours on a Monday morning, after a weekend of late nights and lie-ins, could explain the blood pressure surge. "The increased risk of cardiac events in the early morning, such as heart attacks or strokes, is well-established." 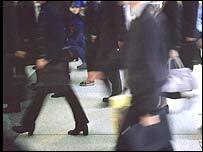 Belinda Linden, Head of Medical Information at the British Heart Foundation, said: "Weekly variations in the incidence of heart attacks and strokes, and in death rates, have been observed by various researchers over the last decade, who have found that Monday is the most likely day these events have occurred. "A morning peak in blood pressure has also been noted by researchers in recent years." But she added: "This relatively small study looks at the weekly variations of blood pressure, and has found that Monday morning provides the highest peak. "Although it is tempting to try and explain these findings, and to assume that the return to work is a factor, the constraints of this study mean we cannot be sure of the causes of this variation. "The BHF believes it is important to try to understand any potential influences of peaks in blood pressure, but larger and better controlled studies are needed to help us do so."